Dr. Quack, the Kinzville Mayor, will be in the Kinzville Park beginning October 9 until Saturday, October 13th. Each day Dr. Quack is in the Park, you will be able to click on him for a Mayor Dr. Quack Gift Box but make sure you have ads on to see him. You can visit him for one gift box per day for each Webkinz account you have. Two of the prizes are new and were shown in the latest spoilers posted by TheSpoilerLurker and are also shown in the picture from Webkinz Newz. 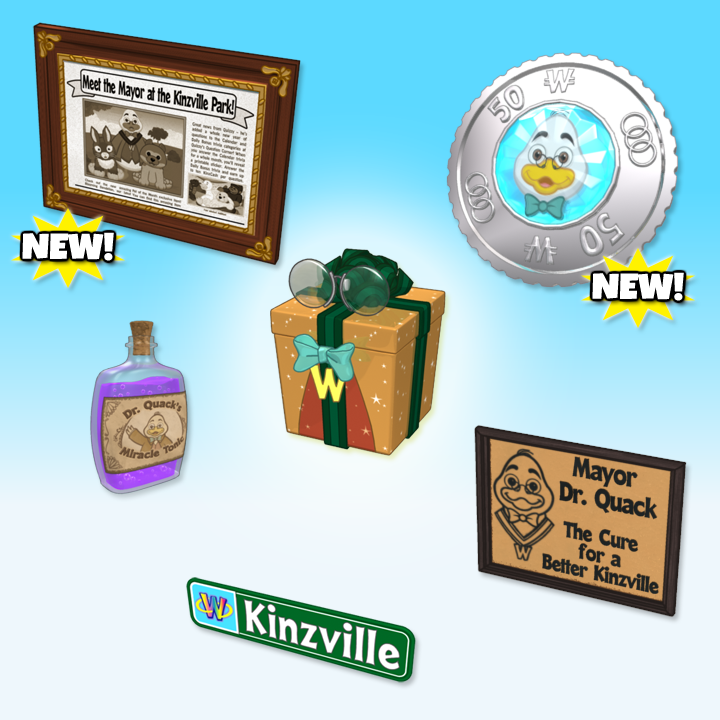 However, Cheese also alerted us that any old Mayor Dr. Quack Gift Boxes contain a mix of new and old prizes when they are opened. i need that newspaper print looking thing! got highlighted and lowlited and got six inches chopped off. i just could not stand it anymore……..it was a hair record combed out, but as she cut it, it all just sprung up into curls……..so now i have to go back to dealing with that. I have the cutest little ponytail going on right now………woot! what was sundays dinner gaga? hope all are well and we have one more day of dreadful ninety degree weather, before fall gets here……….i am so looking forward to it, altho we need firewood bad! wow gaga – i’m surprised that is allowed too – i know different campuses have different rules – i know someone at a campus that doesn’t allow students to carry pepper spray – i was so surprised! So glad that the Star Is Born did not disappoint! I am so looking forward to seeing this movie. I just Knew Gaga was the perfect choice for this movie. Fast Forward, here. I am so doggone frustrated with WW, right now. WHY do we have to change our parent /player info EVERY time there is an Ads On promotional? This is ridiculous, every other Ads on, I have no problems and NOW I have them during this one. Every time I try to log in it tells me I have the wrong profile information and i have no access, so I am going to miss out on what little I can get. I can’t call Ganz because they are open during my work hours and I can’t take my phone on the floor. And they won’t answer emails, either. So I am hooped. No sign of Dr Quack in the park ! Today… another really warm day… not complaining though ! Hope all in Michael’s path are safely prepared ! what does “ads on” mean? 10:30 KinzTime, no sign of Dr. Q. I’m pretty sure I have my ad blocker set to accommodate Webkinz World ads: I can regularly see Mr. Moo and get ice cream from him, and I could see Ms. Cowoline for the costume giveaway, so I think I’m set to see Dr. Quack, if he’s there? No sign yet. I’ll keep checking as toddler allows! Off to go plant flowers! 74 degrees here- WOO! In case y’all didn’t check again recently Dr. Quack is there now..
puma – isn’t it breezy & lovely!?! they are so stinking easy and dh likes them! might change my name to popeye! and dee – 6 inches cut off your hair – wow! i don’t have long hair, but even with long hair, that’s a lot! yay! they are easy peasy moms……..you can add whatever you want…..
anyways, leftover rice, with leftover chicken and some southwest corn and black beans over chips……….mega nacho! i was thinking of throwing some crisped hash browns as a base for mine….but i gots lots of muffin tins! Dixie – Sorry about your frustrations with WW. The only frustration I had today (well, yesterday) was that I couldn’t get into the park to find Dr. Quack. And it was definitely after 10 a.m. (surgery time – ha ha) when I checked. I would click to go in, but nothing would happen. Tried about an hour ago on that account and I got in. I don’t mind the pinky game or the home before dark game. Now if I would be so obsessive and try to do every account it would be easier. I haven’t made any spinach dishes in a while. But I did eat black beans for lunch and dinner on Tuesday. Well, finally off to bed. To all of you who are in the path of Michael….take cover and stay safe.. Thoughts are will all of you ! Dr Quack glitch seems to be fixed…. i do not use the papers, just the muffin tin and mine never stick….i spray with whatever is closest, pam, olive oil etc……..
Moms- I wasn’t concerned before, but I am a little now! I don’t remember Opal at all- I still lived in MI, and was in 5th grade to boot. We still have our hurricane kit from Florence prepared, and we sort of live in a “hole”- a low laying area that’s down a sheltered slope to the south and west so winds often don’t affect us directly. We’re also (and slightly contradictory) at the high point in our cul-de-sac, so all the water drains down the street from us. We also have a GREAT sewer drain at the lowest point in the backyard that I always make sure is cleaned out. Here’s hoping we stay high and dry, and safe from secondary storms! What do you with the Mayer Quack coins? I can’t put them into a storage container. do you like the way i brought down dee with me? Momz – if you wanna feel even older, I was in 5th grade in 2005. Got a ticket on my way to class today. Impeding traffic… the turning lane was not clearly marked and I think the cop knew that because he was sitting there waiting for people. Got someone for the same thing 30 seconds after he left me. He was probably sitting there all morning giving out tickets for it. I’m drowning in schoolwork. Ready for the semester to be over. it is normal to feel overwhelmed……..trust me as a mom of a college student and not so long ago part time college student myself. Gaga, hope you’re doing ok. I usually don’t get here before you. We got pounded with rain this morning…seriously pounded. Now it’s eerily quiet. gaga – is everything okay with you? is everyone safe & sound? Wow! I’m rolling in the KC! Am I not allowed to link? I’ll try this one! Ha ha! Big Money! 5 KC! I really thought it was going to be nothing! But then the 5th roll brought in 5 KC. Ha ha! I don’t really need it, but hey, that’s okay! References to age….I’m probably the old one of the bunch. 5th grade in the 1970’s, specifically 1970, I think. But I’m so young at heart! Ha ha! Choco – Sorry about the ticket! So maddening! Hope the rest of your day is better! Praying for all those affected by H. Michael. Queen, I hit 65 in June. Okay, well you have me by several years! I feel so much younger in a way, and then there are times that I don’t! That was some crazy rain last night, huh Moms? We just got downpoured on all night. No other damage. Lots of sticks and branches down, but easy peasy. And bright clear skies today, with delightful breezes! We played outside, and took kiddo to get his hair cut. Then, more outside playing! I love fall. On a sour note, we learned that our lawnmower shed has RATS! UGH they got into the grass seed. It’s a giant mess. I have a whole vegetable garden full of overripe peppers and tomatoes, but noooo, they want the fescue blend. We had the pest control people put out traps, and caught 2 last night. We’ll get more set on Monday for round 2. I love rats, and have had them as pets, but I like them better when they’re sweet cuddly pets, and not creeping around in the yard eating through my shed! i have trained rat removers……….